When I was a little kid, one of my favorite things in school was getting a hall pass from my teacher. Everyone else would be in class behind closed doors and I could roam the quiet halls, free for a minute or two. I knew I was supposed to go to the restroom and come right back, but I often got a pass for the sole purpose of getting out of the classroom to be by myself. I’d go to the bathroom, but then in a thrilling moment of rebelliousness, would walk back the long way, taking a hallway that wasn’t the most direct route. I had to be careful, of course, because adults were always on the lookout to mess with my fun. If I saw an adult, I would smile at them and walk quickly and purposefully, as if I had somewhere important to go. I think it is this delicious thrill of a stolen, unauthorized moment that carries over into my love for heading out on the road with no one knowing where I am going. A tiny, short interlude in life, unmoored from all of my usual connections. I was going to baseball Spring Training on Friday with Jim, driving from his place in Orange County to Phoenix. I snuck out early, on Thursday night, telling no one where I was going, and not knowing myself. The plan was to drive late in the evening to his area, find a hotel, and not have to get up early for the drive the next day. I didn’t tell him my plan, or my mom or anyone. I drove through the dark alone listening to NPR and electronic music and my own throughts, weaving my way through LAs freeways until I got to Anaheim. 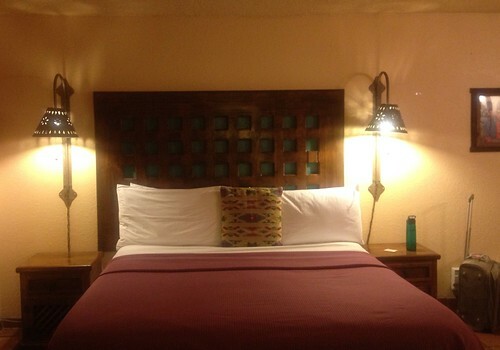 After some minor setbacks (a cheerleading convention was in town, and I was damned if I was going to stay in a Sheraton with 3000 cheerleaders), and consultations with my iPhone travel apps, I found a small, well-reviewed suburban motel at about 11 pm and settled in for the night. Settling in wasn’t without its struggles. First, the motel was designed rather oddly, with a dark parking lot behind a diner and no discernable lobby entrance. I drove around the parking lot and almost flinched at staying there – I was poised to head on, but then I realized how late it was and how much I didn’t want to go back to downtown Anaheim. Once I found the entrance, however, I was relieved and happy to find it was clean and decorated in a pretty Mexican style, with shiny tile floors, colorful fountains and lots of bright artwork. I found my room, got into my jammies and called the front desk for the wifi code. I had a bottle of wine and a corkscrew and wanted a glass of wine. The kitchenette even had nice wine glasses. But my corkscrew was cheap and I could not, for the life of me, get the cork out of the wine. So I put clothes back on, went to the front desk, and asked the nice young men there to open my wine. Sure, single middle aged lady who arrives at 11 pm and comes out in different clothes at 11:30 with a bottle of wine, we’ll help you. I’m sure they’ve seen nuttier things, probably that same shift. I felt a bit gratified that it took them quite a bit of time to get the cork out, too. It wasn’t just my weak arms. A caveat about staying anywhere near Disneyland: the kids in the motel get up early, and they are EXCITED. Excited as in “screaming their fool heads off without stopping.” It was loud but surprisingly didn’t annoy me much. I mean, who can blame kids who are waiting to go to the Happiest Place on Earth? Jim and I met up at the IHOP while he got his car washed and cleaned. The guy at the next table was going on about Obama and socialism and people living off the system. Old white guy with a big gut and aviator-style glasses. Massive eyeroll at Orange County conservatives. Jim and I managed not to duke it out with him. We headed southeast toward Phoenix in Jim’s black Mustang. He loves that car. Pink fuzzy dice and all. I nag him because I think he has a lead foot. He claims you have to drive a fast car like that. I roll my eyes. Lunch in Palm Springs. My first visit to the fabled hideaway in the desert, now a bit of a gay mecca. Gorgeous landscaping, architecture, beautifully remodeled old hotels, charming cafes and shops. If this is the way gay people run things, I say, hand over the reins of power. They’re doing a good job. We lingered a while, sitting on the lawn under a tree drinking fabulous coffee, having a chi-chi lunch of panini and beet and goat cheese salad. Part of the lingering was that the cafe had horrible service – our server took our order and disappeared for almost an hour with no other contact. I went in and tracked her down (it was not busy). Annoyed, she informed me that there was only one guy in the kitchen. Dude. One guy in the kitchen at Denny’s could have turned out 300 meals in that time. I got my salad and started laughing. The big yellow beet slices were warm. The food took so long because they had to COOK THE BEETS. 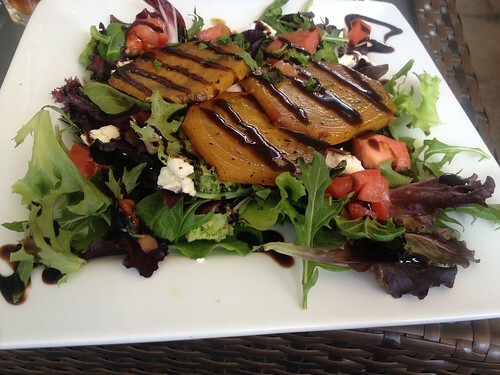 I think the server might have mentioned that they were out of beets. Ah whatever. 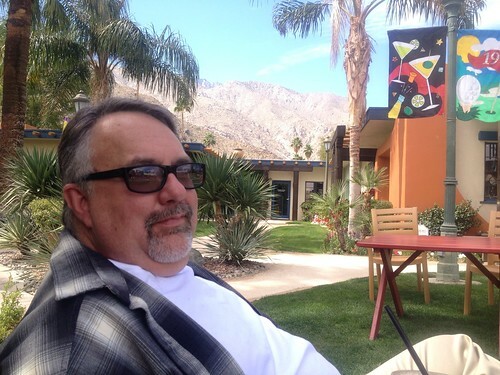 We were sitting on comfy couches on a patio on a warm Palm Springs day. Not really so awful. 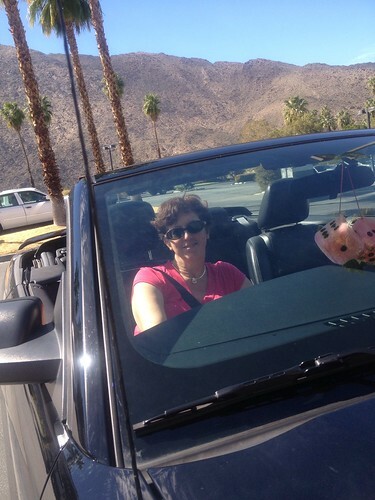 We drove around Palm Springs for a while with the top down, considering abandoning our plans to go to Phoenix. If we didn’t have four baseball tickets in our hands, we might have. Then we were on the road again, heading across the big wide desert. Sounds wonderful. Just like you, going off into the brave new world by yourself. You did that even as a toddler. Looking for a quiet “Sue place”, just so you could be alone for a while. This entry makes me long for Saskatchewan’s long-awaited warmer weather! That’s it. It’s decided. Aidan and I are renting a car this summer and exploring.